Did you know that the kind of table tennis racket you use directly affects your performance? This explains why there are quite a variety of table tennis paddles in the market, all designed to best suit your playing skills and abilities. It is, therefore, crucial to choose the right paddle that well compliments your skills as well as help you improve on your game’s performance. However, there is more to choosing a good table tennis paddle than just performance and personal preference. As much as you may not be willing to compromise on the quality, you also don’t want to spend a ton of money buying a racket. This is probably what makes choosing the right paddle such a daunting experience for beginners and even professional players too. In addition to all these, lots of manufacturers are out there advertising their paddle is the best; which only makes picking the right paddle hectic. Below is an in-depth review of one of the best table tennis racket in the market; the butterfly 603 table tennis paddle. 1 Why do I recommend the butterfly 603 table tennis racket? 1.1 Butterfly 603 is best designed for Whom? Why do I recommend the butterfly 603 table tennis racket? The ergonomics of the butterfly 603 paddle is well designed to offer a superior grip and comfort while playing. The handle has a well-rounded flare design that ensures a firmer grip. This goes a long way in facilitating powerful strikes as well as quality spin shots. Additionally, it is worth noting that this ping pong paddle is designed with a long handle that offers a shake-hand grip. As compared to a pen-hold grip, the shake-hand grip provides more powerful shots with less slyness. And if you are into playing a defensive game, you might consider going for a shake-hand grip paddle. Generally, a rubber layer is the standard design for ping pong paddles. But, the difference lies in the level of the rubber layer covering the blade. As a player, you don’t want a rubber layer that is either too thin or too thick, as this may affect the quality of your shots. The 2.0 mm sponge layer underneath the rubber layer of the butterfly 603 table tennis racket, is sufficient enough to give you superior control over the shots. The Wakaba rubber on both sides of the blade is highly durable and provides extra tackiness for generating great spins as well as forehand and backhand shots. Essentially, the quality of your shots and spins are heavily determined by the weight of the table tennis paddle you are using. A heavy paddle will compromise your game control as compared to a light weighted one. Although, a table tennis paddle may have a well-crafted handle, the quality of the grip may be adversely affected if the weight the paddle itself is not well balanced. The 1.6 pounds weight of this paddle, combined with the flared grip, feels really good on your hand allowing you to fully control the speed of your shots. The price of an item is always a major concern to a majority of the people. However, this does not mean one should compromise on the quality of an item just to save a few bucks nor spend too much so as to get the highest quality. No matter the range of your budget, you should aim at getting a great value for your money. This exactly what the butterfly manufacturers had in mind when designing the 603 ping pong paddle- an affordable high-quality table tennis racket. In addition, the butterfly 603 table tennis racket comes with a heavy-duty gift box that closes with magnetic tabs to keep your paddle safe. Butterfly 603 is best designed for Whom? 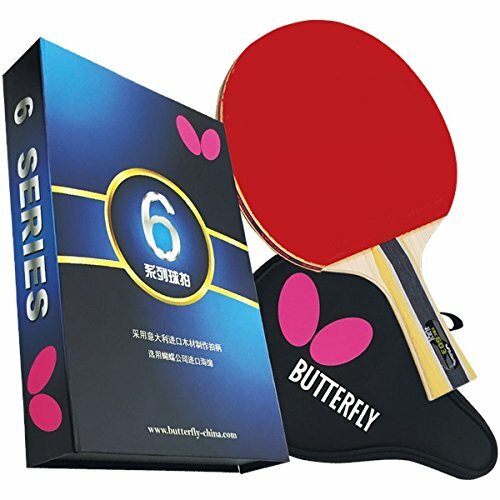 The butterfly 603 table tennis, best suits professional players as well as intermediate players. Simply, because both players are well familiar with the game and their own playing style. This means that both the intermediate and professional players will be able to manipulate the racket’s features so as to deliver a good performance. Moreover, the butterfly 603 paddle gives the player more control of the game, due to its light-weight; making it the best choice for intermediate players looking to up their game. As for professionals who are already familiar with their style of play; this paddle favors a defensive style of play. Thanks to the tacky Wakaba rubbers, one is able to loop as well as block the ball close to the table. If you are playing table tennis as a beginner you might consider going for a more beginner friendly racket. Fortunately, the market offers a wide variety of rackets for all players on all levels including beginners. Alternatively, as a beginner, you can also opt to go for a customized paddle, designed to help you improve your game. The butterfly 603 table tennis racket has a relatively long handle, which makes it suitable for a shake-hand grip. So, if your style of grip is the pen-hold style, this racket may not be the best one for you. It is the shake-hand grip which also makes it less favorable for an aggressive player as compared to a defensive player. Offers great spin and control. Not suitable for aggressive players. The lightweight feels a bit hollow. Q: Are there beginner butterfly table tennis paddles you can recommend? Answer: Yes there is, actually a couple of them. The butterfly 401 table tennis paddle and the butterfly Baslo carbo x5. Among the two, I would recommend the butterfly 401 mainly because of the rigid carbon layer that facilitates powerful shots. Q: Can the rubber on the paddle be replaced? Answer: No. But, there is no need to worry about replacing the rubber. The quality of the Wakaba rubber used in this paddle is of high quality and long lasting. Thus, there is no need for replacement. Q: what is the control, spin and speed ratings of this paddle? Answer: The control is 85, the spin is 90 and the speed is 82; which are all quite on point for a good performance. Table tennis or otherwise known as ping pong is a fun game and easy for anyone since it doesn’t involve too many rules. Whether you are playing it for fun or as a professional, you cannot afford to overlook the importance of a good racket that best compliments your skills and style of play. Although it all narrows down to a personal choice and preference, the review above will give you a reason why you should go for the butterfly 603 table tennis paddle.